SPONSORED--When we say that Duncan's Burgers simply belong to this neighborhood's finest burger offering, it's not a small compliment. Bushwick simply loves its burgers and is used to a very high standard. We like our burgers affordable yet made of quality grass fed beef. Moreover, they must have that burger je ne sais quoi tasting like tradition combined with a flame of innovation and uniqueness. 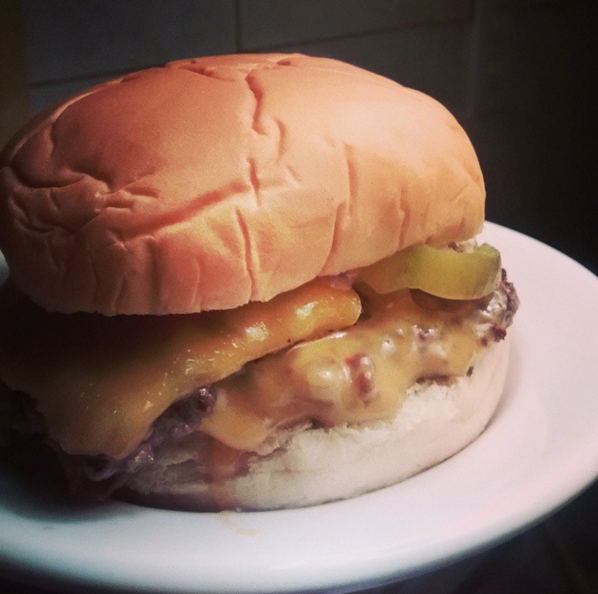 Luckily for us, Duncan Burgers are just that -- deliciously soft and juicy and starting on as little as $3.50. For several months Galen Duncan and his Duncan's Burgers have been popping up around Bushwick in several locations lending them a feel of an illusive, whimsical, adventurous and juicy moment. Recently, Duncan's Burgers found their home at Patio del Gato, a patio at 434 Troutman Street right behind to The Bodega Wine Bar. You can swing by Tuesday through Sunday from 5pm to midnight. Newly Duncan's Burgers have been offering a really cool Bushwick bar delivery service, which will come especially handy as the temperatures are hitting the freezing point. While you're hanging out at Pearl's, The Keep, The Sampler, The Cobra Club, The Johnson's, Karmann Bar (at Cafe Ghia) or Three Diamond Door, you can simply text your order at Duncan at 4068-DUNCAN(386226) (or order online) and soon expect a delivery of a little package of mouthwatering deliciousness right to your barstool. "What's the catch," you're asking. Well, there is no catch; no fee; no minimum; just plain awesome, deliciously convenient burgers. Note that Duncan currently accepts only cash. Don't forget to instagram your happy burger face and hashtag #barstooldelivery and tag @duncansburgers. The best photo wins a free burger!